This beautiful block is totally hand pieced, using the English Paper Piecing method. It can be made using two fabrics or four fabrics (like in my sampler quilts shown on the Learn to Quilt page) or a variety of scrap fabrics as shown above. 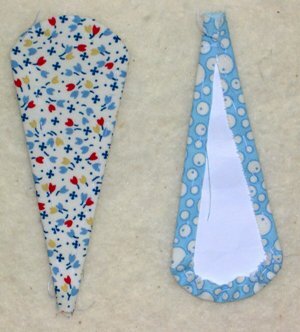 The fabrics are basted onto paper templates which are later removed. In the old days, when quilters developed the Dresden Plate Quilt Block, they sometimes cut paper templates from newspapers, and left the papers inside the quilt for extra warmth - this has been one method of dating old quilts as the date was on the newspaper found inside! To begin your dresden plate quilt block,you will need one package of Dresden Plate paper pieces - most quilt shops stock these items, or you can cut your own. Cut 16 fabric "petals", using one of your paper templates as a guide. Make sure you add a generous 1/4" all around, as shown. Wrap the fabric around the paper, and using a needle threaded and with a large knot at the end of the thread, sew (or baste)large stitches through both fabric and paper. Having a thimble on your middle finger will help. Stitch along one side, then make large stitches through just the fabric of the rounded part, pull it snug over the paper template, then stitch down the other side through all three layers (fabric, paper,fabric). Do not fold the bottom point up as it will be covered by the center circle. When you have basted all the fabric pieces onto all 16 of the paper pieces, you may join the petals. Place two petals right sides together, and whip-stitch one edge using small stitches. Try not to catch the paper in the stitches. Continue adding more petals until all 16 are together. 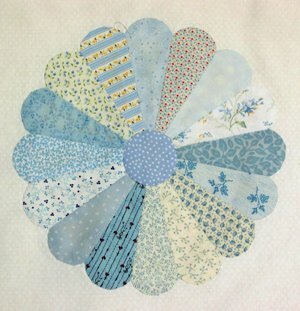 For the center circle, cut a fabric circle a generous 1/4" larger than the paper template. Stitch large basting stitches all along the edge of the fabric circle, then place the paper template in the center and pull your basting thread tight. Press with steam, then loosen the thread and remove the paper template. 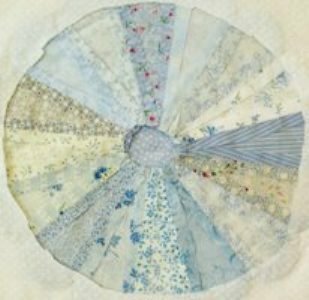 Using small stitches and a matching thread, sew to the center of your Dresden Plate. From your background fabric, cut one 13" square. Center your Plate on the background square and pin in place. Using tiny stitches and a matching thread, stitch all around the outside of the Dresden Plate. Turn your block over, and carefully cut away the inner circle (inside your stitching), leaving at least 1/4" seam allowance. Now remove the basting stitches and take out the paper pieces. Your Dresden Plate Quilt Block is done. This is the back of your Dresden Plate Quilt Block with the paper removed. Now you can press your block, and trim it down to 12 1/2". Sometimes when we applique (stitch the dresden plate onto the background), it pulls the background fabric in a little bit so it is easier to start with a larger background square, and then trim it down to size later! Can you imagine a quilt made up of these blocks only? I am currently working on just such a quilt. I am using my blue scraps and a white on white background. The photo shown above is one of my blocks. When I have the quilt finished, I will show it in the Quilt Gallery. I love to have some hand stitching with me at all times so that I have something to occupy me when waiting for ferries, buses, doctors, whatever......and I end up with a beautiful quilt! Finished with "Dresden Plate Quilt Block" Return to "Learn to Quilt"
Or go to "Card Trick Quilt Block"